This week I was caught up in all things China. It probably started a few weeks ago, when I got stuck into Andrew Marr’s documentary series, The History of the World. It turns out (as most history buffs already know) the Far East has been influential for many revolutions across the globe, driven in part by the innovation, trade and knowledge that flowed down the Silk Road into the West. Fintech is no exception. This is made evident when you start looking at the emerging tech players in China and their foray into financial services – AliBaba Group with Alipay and Tencent with WeChat. What is interesting, is that neither company started out as a pure fintech play or as a bank disruptor. Instead, after mobilising millions of users through their respective platforms, they realised continued growth could be found by moving laterally into other markets – like banking. I’d say we’re yet to really see a western fintech company do something similar, although Apple Pay and Facebook Payments probably come closest. Currently, most fintech startups pick existing financial verticals – like lending, investments, payments or currency transfer, and then play within their four walls. Yet ironically, what consumers and businesses are looking for is less fragmentation of their financial services, not more. 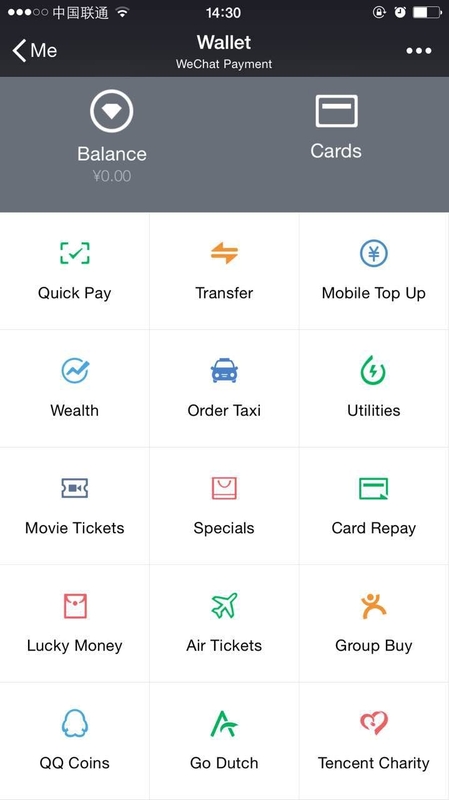 What’s especially interesting about WeChat is that it delivers a nearly frictionless financial integration experience into a users life, allowing for p2p payments, bank transfers and wealth management alongside food delivery orders, taxi bookings and mobile phone top-ups. And all from the palm of your hand. What WeChat and Alipay have achieved through their mobile wallets is what PayPal has been struggling to do for years – integrate their offerings into their users everyday lives seamlessly. For some reason, mobile wallets are still clunky and awkward in the west, hampered by a chicken and egg problem of usage and acceptance. In developed economies there’s also the dual problem of widespread card usage, which is still very efficient, especially since the introduction of NFC. In China, card usage lags. It would appear Chinese consumers find it far more palatable to leapfrog plastic altogether, going from cash to mobile wallet in one fell ‘swipe’. This week I spoke with a friend of mine, Rose, who is currently on exchange in Guangzhou in Southern China. She walks me through her WeChat experience so far, its ability to connect strangers, split bills, pay rent to her landlord, and all with the virtual human smile of an emoji or avatar at the other end of the transaction. Just think how much happier we’d all be if our banks sent us smiling bunny rabbits and fuzzy cats when they received our payments. You can listen to my interview with Rose below.